I wasn’t quite near the final lightning strike when it hit. During Fornite Battle Royale’s last season, a giant rocket launched and cracked the sky wide open, tearing the game’s space-time apart. 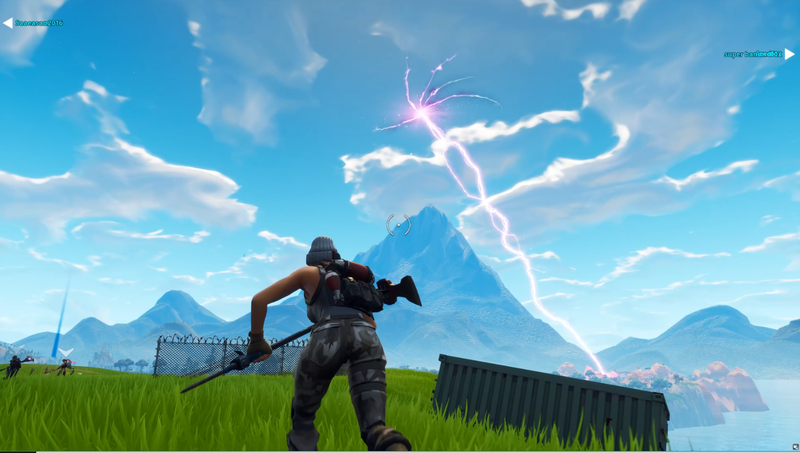 When Season Five hit—adding a new desert area to the map—the rift seemed to die down, but now it’s blasting the ground with massive lightning strikes. The lightning strikes are coming down on a mountaintop near the lake southwest of Paradise Palms. The massive sky crack is slowly closing above it, blasting down huge lightning bolts. These lightning bolts were originally striking cacti resting on the top of the mountain. At first there were eight; now all of them have been destroyed. The lightning is now striking a nearby rock about every three minutes or so. It’s not entirely clear what will happen, if anything, now the final cactus is blown to smithereens, but the game’s community is eagerly awaiting it. Dedicated players have been calculating the changes in lightning frequency, which increased significantly in speed over the last 24 hours. Others had stubbornly built forts around the last cactus in an attempt to foil whatever supernatural nonsense might follow the final lightning strike. Those attempts failed, and the community is waiting for whatever comes next.